SKU: 5015600513895831 Categories: Plus Size Bras, Plus Size One Piece Swimwear. Tags: Bralette, bras, Breast Support, Bust, Bust Enhancing, Category, Fashion, Intimates, lingerie, Racerback, Rhonda Shear, Solution, Target Zone, Under $50, Unlined. Have you had your ah-ha moment with a Rhonda Sheer bra yet? The Ahh Cutie Racerback Bra by Rhonda Shear is the racerback bra that’s so comfortable women everywhere are saying bra-vo! The secret is the Rhonda Shear knit-in cup. This cup contains no padding or support panels which may become uncomfortable with extended wear. 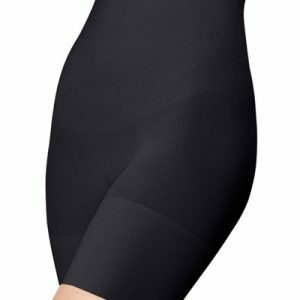 The knit fabric gives great support and light compression. The knit underband keeps you secure and comfortable. This is a wonderful option to wear with sheer fabrics. Where other bras may show through, the seamless sides and smooth body of this piece are virtually invisible. Plus it’s free from extra decorative details that might stick out. This is a pull-on style bra so there are no fasteners to open or close. One of best qualities of this piece is its overall breathability. Its nylon and spandex blend is so soft to the touch that you won’t want to take it off. One thing’s for sure, once you’ve tried the sheer magic that is the Ahh Cutie Racerback Bra by Rhonda Shear you’ll want to wear it again and again. RESULTS Light all-bust control Eliminates bra bulge Soft shaping Smooths the silhouette under clothes FEATURES Woven cup bra No additional padding or support panels Knit underband Breathable material Materials: Nylon 92%, Spandex 8% Size Chart: Compare your cup and band size on the chart below to find the best size for you.